While the U.S. invests in commercializing plug-in vehicles by 2016, Nissan says it will have an electric vehicle ready by 2010 and Tesla strikes a deal with Daimler. The ability to drive greener with an electric vehicle received a strong boost this week, but challenges still remain when it comes to getting the masses behind the wheel of an electrically charged ride. On Thursday, the U.S. Department of Energy announced it would dole out $30 million in funding to three companies over three years to further the development of plug-in hybrids. The hope is that the money will be used to drive down the cost of the vehicles so they will be ready for commercialization by 2016. 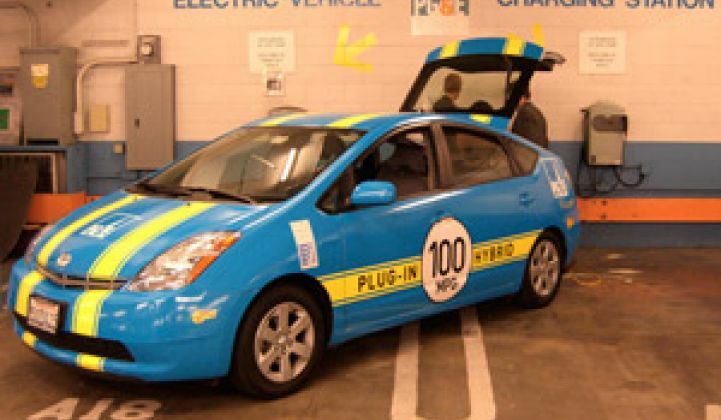 About 150 plug-in hybrids cruise U.S. roads, according to April stats by CalCars.org. Utilities, research institutions and a handful of early adopters own most of the vehicles. Among those getting a piece of the DOE funding is General Motors (NYSE: GM), which will use the money to advance the improvement of lithium-ion battery packs and their charging systems. The auto giant will also integrate its research into a test fleet. Ford Motor Co. (NYSE: F) will use the money it snagged from the federal government to improve battery systems and to build plug-in hybrid prototypes. Finally, General Electric (NYSE: GE) will use its portion of the funds to develop a battery storage system that will enable an electric driving range of 40 miles. The technology and service giant will partner with Chrysler for the project. Advancement in battery technology is key to getting better range out of plug-in hybrid and all-electric vehicles. Providing consumers with the freedom to drive great distances – similar to that of a gasoline-powered car at a cost-competitive price – is expected to open doors to mass adoption of plug-in hybrids and eventually all-electric vehicles (see Batteries Key to Plugging in at Electric Vehicle Symposium). Nissan Motor Co. (NSDQ: NSANY) is also looking to boost its green vehicle offerings. The Japanese automaker will sell an electric car in the United States and in Japan by 2010, The New York Times reported Friday. The company declined to say how many electric vehicles it plans to sell and how much they will cost, according to the newspaper. Nissan wasn't the only major manufacturer that announced efforts to produce a greener fleet. Toyota Motor said Wednesday it intends to expand its presence in the electric car market when it starts a full-scale production of lithium-ion batteries in 2010 (see Toyota Drives Towards Greener Fleet). The Japanese auto giant currently uses nickel-metal hydride batteries in its hybrid vehicles like the Prius, which the company launched over a decade ago. Some analysts and companies have said the batteries are limited by the amount of energy they can store and that lithium-ion ones will improve upon such limitations. Smaller, electric vehicle makers also made news this week. Tesla Motors has supposedly inked some sort of technology deal with Daimler, according to FoxBusiness. “We have [a] small deal that could potentially lead to a very big deal,” Tesla Chairman Elon Musk told the media outlet Wednesday. Tesla did not return Greentech Media calls requesting more information. However, Tesla striking a partnership with a major automaker isn't that surprising. In February, the San Carlos, Calif.-based company told Greentech Media that it wants to partner with a large automaker that can manufacture its third vehicle model at "high volumes" (see Tesla to Big Three: Let's Be Friends). Not all of this week's news was positive and chummy for electric vehicle makers. Tesla's lawsuit against Fisker Automotive over allegedly stealing Tesla's design and trade secrets has been scheduled to go to arbitration, CNET reported Thursday. In April, Fisker CEO Henrik Fisker, called the lawsuit nonsense and struck back, alleging that Tesla had breached an arbitration agreement between the two companies when it filed the "meritless claims" (see More Speed Bumps for Electric Cars?). Fisker Automotive is developing the Fisker Karma, a plug-in hybrid with a solar panel, which it unveiled in January.